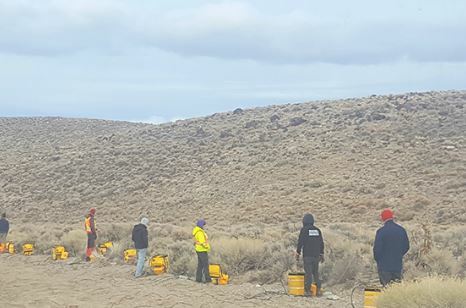 The Quantec MT geophysical survey at Belmont’s Kibby Basin property in Nevada. Source: Belmont Resources Inc.
Belmont Resources Inc. [BEA-TSXV; L3L1-FSE] shares rallied strongly Wednesday June 20 after the company said it has received borehole drill permits for a proposed drill program at its Kibby Basin Lithium Project in Nevada. “A drilling contractor has been selected and drilling is anticipated to commence in July 2018,” said Belmont President and CEO James Place. Belmont jumped 25% on the news, rising $0.01 to 5 cents on active volume of 4.03 million. The stock is trading in a 52-week range of 2 cents and 6.5 cents. The announcement comes after Belmont said it has entered into a consulting contract with Nevada Water Solutions of Reno to file for water rights to support future potential groundwater (brine) development for the extraction of lithium in the Monte Cristo Valley Groundwater Basin in Esmeralda County, Nevada. The permit application covers the Kibby Basin property. The company has said it was is encouraged with last year’s drill core assays, ranging from 70 ppm to 200 ppm Li with 13 to 25 core samples assaying over 100 ppm Li; indicating that sediments could be a potential source of lithium for underlying aquifers. The MT survey covered most of Belmont’s Kibby Basin claims and included the playa basin area as well as some of the adjoining higher level lands. Belmont recently submitted the NOI (notice of intent to conduct exploration) application for test hole drilling at Kibby to the Bureau of Land Management (BLM). In a May 23, 2018, news release, the company said its drilling plan had been reviewed and accepted. The objective of the MT Survey was to map potential saturated lithium brine on the Kibby Basin property. Lithium-rich brine of this nature should be associated with a very conductive zone at depth as lithium brine deposits are accumulations of saline groundwater enriched in dissolved lithium. It means Belmont has found highly prospective and precise targets for the next phase of drilling. On Wednesday, the company said the first holes will be advanced in locations where the MT survey indicates that the conductive anomaly is closest the surface. On March 30, 2016, the company acquired 16 placer mining claims, representing 1,036 hectares in Esmeralda County. The Kibby Basin property is located 65 km north of Clayton Valley.